Brenau University offers tuition discounts for active duty military personnel, dependents and veterans. The discount is available for on-ground and online undergraduate and graduate coursework. Do Military and Veteran students receive honors at Graduation? Yes, an honor cord is presented to each graduate who participates in the ceremony. Additionally, undergraduate students meeting the requirements of Latin honors will also receive honors at graduation. Are there Military and Veteran student lounges available? 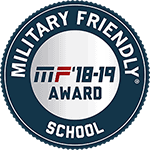 Yes, there is an area reserved for our veterans and active duty military students on all of our campus locations: Augusta, Fairburn, Gainesville (Owens Student Center), Jacksonville, and Norcross. What are the Green Zone stickers on Brenau office doors? The Green Zone stickers indicate the person in that office has completed the Brenau University Military and Veteran Diversity and Sensitivity training. Brenau University its prestigious designation as a Military Friendly School. pursue other careers in civilian life.